I have been super busy this month and haven’t had much time to read. It’s been put on the bottom of my “to-do” list. For the past few weeks I’ve been so exhausted when I get home that I just watch a little TV and go straight to bed. However, I have found just enough time to suggest some books for the August edition of “My Favorite Reads”. Before I start my suggestions list, I’ll fill you in on the book I’m currently reading. It’s called Beneath A Marble Sky. I’ve ventured to the eastern part of the world this time, India to be exact, to learn the story of why and how the Taj Mahal was built. Yes, this is another historical fiction novel with a love story intertwined between actual facts. What more can one ask for? I’m not terribly far into it yet, but so far so good. Julia: Daughter of Rome by Elizabeth Elson. This is a quick read, but a really good one at that. We’ve often heard about Octavian, the first Emperor of Rome, and all the stories that go along with his quest to the throne. However, a lot of us fail to realize that he had a daughter named Julia. And even fewer know her story. This tale follows her life as a strategic pawn for her father’s personal gain. One for the Money (& the Stephanie Plum Series) by Janet Evanovich. It takes a lot to get me to laugh out loud when I’m reading a book. Nothing is ever that funny in writing unless I’m writing it…just kidding. However, this book and the rest of the fourteen in the series were just hysterically. Don’t freak out about the fact that I just said there are fourteen other books in this series. They were incredibly fast reads, not only because they weren’t that many pages, but also because you couldn’t put them down they were so good! Follow Stephanie Plum as she begins a new career as a clumsy bounty hunter in New Jersey and the comical characters she enlists to help her catch the bad guys. 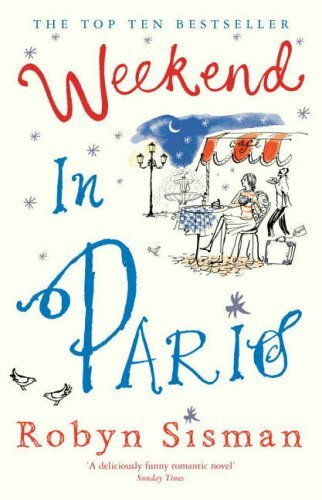 Weekend in Paris by Robyn Sisman. Two books in a row that aren’t historical fiction novels? Sam… is this true? Yes. Yes it is. I figured it was about time that I put something other than historical fictions on my list since I know many people prefer other genres. Your welcome, Aly. This book is a good, easy summer read. It’s light-hearted, romantic and will make any young, single girl want to jump on a plane to Europe immediately. Trust me… I almost did. Enjoy the suggestions and check back next month for some more fun books! For more book suggestions check out My Favorite Reads: June Edition and My Favorite Reads: July Edition. ← First Week is Complete!